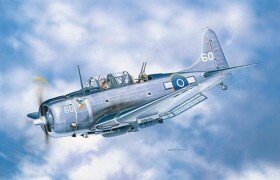 Douglas SBD-5 Dauntless - 1/48 - NOVIDADE! The Douglas SBD Dauntless was the standard bomber of the US navy in the first years of the Second World War. Almost 6,000 of them were constructed in six main versions, and they operated in the Pacific theatre. ?Of the many battles in which they took part, the Battle of the Coral Sea and the Battle of Midway come to mind. Although the technique with which this airplane was to be used, dive bombing, was soon obsolete, the SBDs remained in service. ?The last great operation in which they were employed on a large scale was the Battle of the Philippine Sea. They were eventually replaced by the SB2C Helldiver.